Many Cerebral Palsy Research Network (CPRN) investigators are in Hollywood Florida this week for the 70th annual meeting of the American Academy for Cerebral Palsy and Developmental Medicine (AACPDM). This meeting of the professionals that treat cerebral palsy provides a great opportunity for our first in-person investigator meeting. The CPRN investigators have met telephonically since charter members were selected in February 2016. The meeting is planned for Friday, September 23rd from 12:30 to 1:30 pm at the Diplomat Hotel. The meeting will give investigators an opportunity to discuss CPRN’s progress and future directions. More than 20 investigators have RSVP’ed for the meeting. CPRN leaders Amy Bailes, Ph.D., Mary Gannotti, Ph.D., Paul Gross and Garey Noritz, M.D. are also slated to present CPRN to members of the academy during a breakfast session also on Friday morning. The speakers will present an overview with details of the CPRN registry data collection through the electronic medical record system, quality improvement initiatives and the adult patient-reported outcomes registry. Paul Gross will also present CPRN to attendees of the AACPDM Community Forum on Saturday. 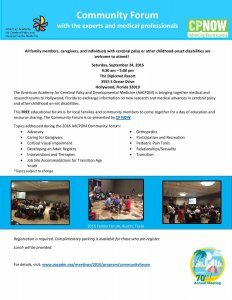 This event, which is free to the public, runs in parallel with the AACPDM annual meeting to allow people with CP and their caregivers to tap into the expertise of AACPDM membership in attendance at the meeting. CPRN patient engagement director Michele Shusterman of CP Now Foundation and CP Daily Living has organized this year’s Community Forum. This presentation will be the first time that CPRN’s development and activities have been presented to a lay audience and we look forward to the CP community’s feedback.